Gala Held To Recognize City’s Visionaries Past And Present Who Have Elevated The Community While Benefiting Health And Wellness Needs of Boca Raton Nonprofits– The Rotary Club Downtown Boca Raton announces the inaugural George Long Award honorees, host committee and initial sponsors for Boca Raton Mayors Ball, a black-tie dinner/dance gala to held at Broken Sound Club (BSC) on Saturday, October 17, 2015. Featuring a grand epicurean experience created by BSC Executive Chef Joe Longo, Jr. set amidst City-themed décor and the live music of the Steve Chase Band, the first-time event is planned to be an annual early season opener to honor the elected officials who exemplify Rotary International’s motto, ‘Service Above Self’ and the City’s visionaries past and present who have elevated the community will raise funds to support health and wellness needs of Boca Raton nonprofits. Barb Schmidt – A practitioner of mindfulness and meditation for more than 30 years, Schmidt is the author of the international best-selling book, The Practice: Simple Tools for Managing Stress, Finding Inner Peace and Uncovering Happiness,and the founder of the Boca Raton-based nonprofit organization Peaceful Mind Peaceful Life. Her passion is to enrich her hometown community of Boca Raton, greater South Florida as well as the global community by making mindfulness teachings accessible to everyone. Believing that outer peace begins with inner peace, in 2006, Schmidt helped launch Peaceful Mind Peaceful World a community outreach program with the Dorothy F. Schmidt College of Arts & Letters that presents workshops and weekly teachings intended to help people cultivate a peaceful mind so that they can lead strong, loving, peaceful lives. Her program has hosted notable speakers, such as His Holiness the Dalai Lama; Dr. Jane Goodall; medical intuitive Caroline Myss; neuropsychiatrist and medical intuitive Dr. Mona Lisa Schulz; author and clinical psychologist Dr. James Finley; authors Dan Millman and Dr. Andrew Weil, and other distinguished guests. Recently as part of her inner peace initiative with the FAU Peace, Justice & Human Rights Institute she brought thought leaders Jetsunma Tenzin Palmo and Gabrielle Bernstein to share their teachings on living life in the midst of our constantly changing world. In addition to her international book success, more than 3 million Facebook fans, and significant media coverage in several languages, Schmidt most recently launched ZenSports, an initiative to provide mindfulness tools for improving performance, by giving athletes, coaches and trainers a practical, easy to follow approach to a more present, calmer, focused life both on and off the field. American Association of Caregiving Youth (AACY) – A champion for the silent, hidden and deserving youth, this nonprofit has garnered national headlines, including its founder who garnered international acclaim when nominated for her leadership as a Top Ten CNN Hero in 2012. The Boca Raton-based organization’s program Caregiving Youth Program (CYP) is the first S. comprehensive program to address the challenges faced by children who sacrifice their education, health, well-being and childhood to provide care for family members who are ill, injured, elderly or disabled. The replication of its work has been made possible in other states and through its newly established Caregiving Youth Institute that makes its impact of benefit to communities beyond its home in Boca Raton and Palm Beach County. The CYP seeks solutions as it promotes social and system change by integrating healthcare (body), education (mind), and the community (spirit) to create a solid foundation of support services for this youth population. It works to reduce barriers to learning and enhanced life-balance via its needs–driven in-school, at home and outside of school direct services, resources and programming. As of June 30, 2015, more than 990 youth caregivers plus their families entered the CYP through middle schools, self and community referrals in Palm Beach County, FL; others are in various stages of program processing. Youth caregivers elect to remain with the CYP throughout high school – and they do – they also graduate at a rate of more than 95% with more than 75% going on to college. Boca Raton Bowl (BRB) – This postseason collegiate football bowl game that first ‘touched down’ in 2014 to bring the national spotlight to Boca Raton aired live on ESPN throughout the U.S. as well as its international affiliates in South America, Asia, Australia and Europe. More than 2.5 million households watched the game that generated a 1.5 rating in the U.S. The Palm Beach County Sports Commission conservatively estimated the event resulted in a direct local economic impact of over $4 million, contributed more than 4,000 room nights in Palm Beach County with more than 8,000 out-of-state visitors. Each year, the bowl will bring about 500 student-athletes, coaches, administrators and support staff to visit Boca Raton and draw thousands of alumni and fans from the two participating schools. Promotional commercials on Boca Raton are featured throughout the game broadcast that kicks off a new destination tradition as ‘Boca’s Biggest Annual Outdoor Party’. 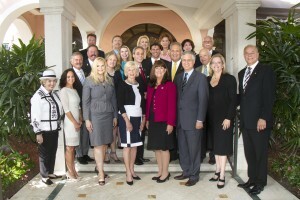 The host committee for the gala presented in the tradition set by the iconic cities of Miami, Fort Lauderdale and Palm Beach where Mayors Balls have long been coveted celebratory ‘must go’ annual events includes: Helen Babione; Patricia Carpenter; John Crean; Mary Csar; Jamie Danburg; Jerry Fedele; Andrea Garcia; June Gelb; Glenn Gromann, Esq. ; Florida State Representative Bill Hager; Rick Hayduk; Arlene Herson; Gloria Hosh; Bonnie S. Kaye; Dr. John Kelly; Karen Krumholtz; Christine E. Lynn; Debbie Leising; John Mulhall, Esq. ; Troy McLellan; Bonnie Miskel, Esq. ; Randy Nobles; Richard Pollack; Douglas Rolfe, DDS; Jan Savarick; Steve Schmidt; Coach Howard Schnellenberger; Tim Snow; Pat Thomas; Bob Tucker and Pamela Weinroth. Mayors Ball Co-chair Oeltjen reports that funds raised each year through the annual Boca Raton Mayors Ball will fulfill grant requests approved through the Rotary Club Downtown Boca’s formal grant application program managed to be unveiled in October that will be open to all Boca Raton-based nonprofits with needs for health and wellness services and programming. Christine E. Lynn Foundation; GrayRobinson Attorneys At Law; JM Lexus; Kaufman Lynn Construction; Viner Foundation. Table sponsors to date include ADT; Dunay, Miskel & Backman, LLP; BankUnited; Boca Raton Firefighter & Paramedic Benevolent; Boca Raton Regional Hospital; Florida Atlantic University; Investments Limited; Office Depot and TD Bank. Boca Raton Mayor Susan Haynie serves as honorary chair. 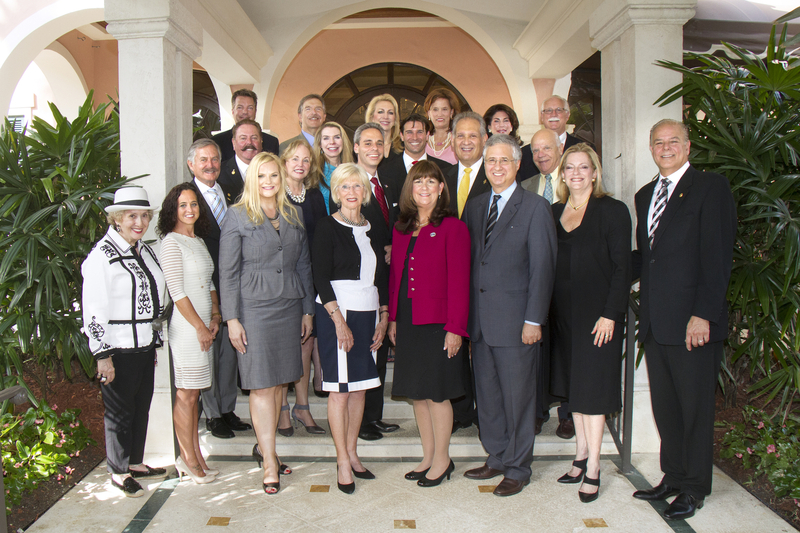 Honorary advisors include former mayors Susan Whelchel and Steven Abrams, who currently serves as a Palm Beach County Commissioner and Bill Smith; Boca Raton Deputy Mayor Robert Weinroth; Former Deputy Mayor Constance Scott and Council Members Michael Mullaugh, Jeremy Rodgers and Scott Singer. Dr. Ron Rubin, Howard Tai, Robin Trompeter, Michael Walstrom and Janice Williams. “The Mayors Ball is a tribute to those who have made this community the best it can be and the generosity that continues to make a difference in the lives of so many,” said Rotary Club Downtown Boca Raton President Jon Kaye. “We expect the dance floor to be filled, reconnections made, and relationships renewed and strengthened as together we celebrate ‘all that is Boca’.” For sponsorship/underwriting opportunities and ticket reservations, visit www.rotarydowntownbocaraton.org or contact Deborah Freudenberg at 561-299-1429, email info@rotarydowntownbocaraton.org. Recently named the 2014-2015 District ‘Rotary Club of the Year’, the Rotary Club Downtown Boca Raton is dedicated to impacting the Boca Raton community through Rotary International’s mission of “Service Above Self”. The award-winning 501(c)3 nonprofit’s purpose is to make a difference in its community by enhancing the lives of many in an environment embraces and promotes integrity, friendship, camaraderie and trust. While the Mayor’s Ball will fund the Club’s grant program, the Club also presents the “Annual Honor Your Doctor Luncheon” founded by Helen M. Babione that for 18 years has recognized physician leadership and excellence in healthcare while raising scholarship monies for nursing students at Florida Atlantic University, Lynn University and Palm Beach State College and medical students at Florida Atlantic University. The Rotary Club Downtown Boca Raton is one of Rotary International’s 34,000 clubs in more than 200 countries that connect 1.2 million Rotarians with diverse cross-sections of thought and action leaders and stakeholders, link diverse perspectives and build lasting relationships to take action in communities at home and around the globe.